A "killer" fish native to South America has been found in a Devon river. The Environment Agency said its staff were amazed to find a dead piranha in the East Okement tributary of the River Torridge. 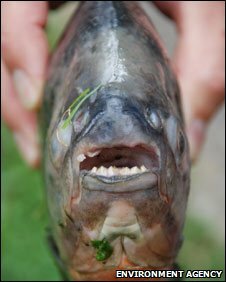 The piranha, which has razor-sharp teeth, is generally considered to be the most ferocious freshwater fish in the world. The 35cm (14in) fish was spotted by Bob Collett, Dave Hoskin and Eddie Stevens during a sampling trip on the river. Among the species the team would have expected to find in the river were salmon, brown trout, bullheads, stone loach and minnow. "What we actually discovered was something we would not expect to find in our wildest dreams - we could hardly believe our eyes," Mr Stevens said. "After completing 20m of the survey, a large tail emerged from the undercut bank on the far side of the river. "Our first thought was that a sea trout had become lodged in amongst the rocks and debris collected under the bank, but when it was removed from the river we were speechless to find it was a piranha." Tests carried out on the dead piranha revealed it had been eating sweet corn, which proved it must have been kept as a pet. The Environment Agency said the average size of a piranha was 15 to 20cm (6in to 8in), making the fish found on the East Okement an exceptional size. A shoal of piranha fish is said to be able to strip the flesh of large animals within minutes. They have also been known to attack humans. 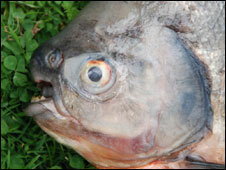 In the wild, piranhas are found in the Amazon basin, in the Orinoco and the rivers of the Guyanas. The Environment Agency said it believed the piranha was alive when it was put in the river, possibly because it had become too big for its tank. Spokesman Paul Gainey said: "Whilst piranhas can't survive the colder climates of the UK, this latest find highlights a real issue - that releasing unwanted exotic pets or plants into rivers can have serious consequences for native wildlife. "Rather than dumping things in the wild, we would urge people to seek advice about what to do with exotic species."